Home » Events » 2016 Summer Performance Series! 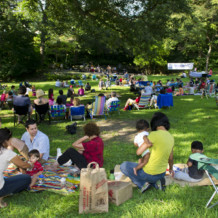 It’s one month to the start of our 2016 Summer Performance Series in Glen Providence Park! We are delighted to present our fifth year of concerts, with the addition of Shakespeare in the Park! We’ve scheduled another eclectic mix this summer, with Rock-Indie-Bluegrass; a Singer-Songwriter; Opera, Show Tunes & Jazz; and A Midsummer Night’s Dream! Summer Afternoons in the Park! Enjoy a late afternoon performance at the historical concert stage, then walk 2 blocks into town for dinner and shopping on State Street! The 5th Anniversary weekend for Friends of Glen Providence Park! This Performance Series is made possible with the generous sponsorship of the Media Recreation Board and Media Rotary Foundation. Additional funding is provided by restaurant sponsors (within blocks of the park’s main entrance! ), and donations from individuals like you! We are grateful to Delaware County Parks & Recreation, without whose support these concerts would not be possible. And thank you to our volunteers who clean and decorate the stage for each concert. Performances are at the Glen Providence Park Stage, by the main entrance on State Street in Media. Rain dates are the Sunday after each scheduled performance. If the rain date is used, the decision will be posted by 12:00 noon Saturday on our website and Facebook. Seating is on the lawn – bring your blanket or chair, and perhaps bug spray! There is a parking lot at the State Street entrance and along State Street and West Street. We encourage you to walk or take public transportation: the main entrance is just 2 blocks from the end of the Media trolley line, or less than a .6 mile walk from the Media train station. More details on each performance coming soon! Read about the decades of concerts in the park, from 1937 to the 1970’s. Read recaps and see photos from our past concerts. Read about our September 2011 project to restore the concert stage.